Ashton Trinity Lodge No 8821 has its installation right at the end of the Masonic season, but it’s always well attended and the brethren again assembled in numbers to witness Howard Morris install his successor Kim Lyon into the chair at Ashton in Makerfield Masonic Hall. Tony Bent congratulates Kim Lyon on attaining the chair of King Solomon in Ashton Trinity Lodge. 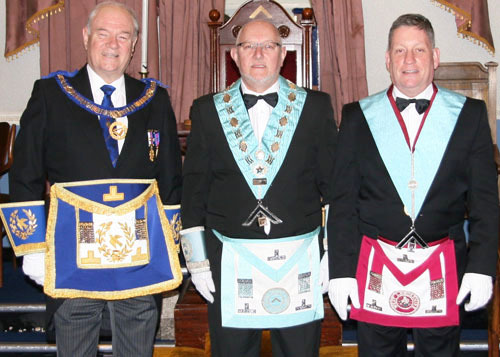 Assistant Provincial Grand Master Tony Bent was the principal guest, accompanied by fellow grand officers including group chairman Geoffrey Porter together with Graham Hughes and David Ogden. They were supported by acting Provincial officers Garry Bryon (PrJGD), David Kenworthy (PrGSwdB), David Rigby (PrGStwd), Trevor Jones (PrGStwd) and Fred Dickinson (PPrAGPurs). A fine team was orchestrated by DC Tony Simms, with many of the brethren taking an active part in the ceremony. 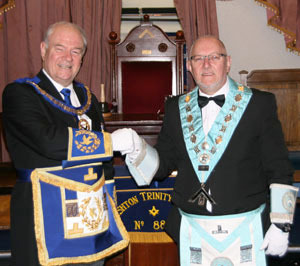 Tony himself, a former schoolfriend of Kim and his seconder into Masonry, was delighted to present him. Malcolm Rush delivered the address to the new WM and Alan Keary delivered the address to the wardens. Pictured from left to right, are: Tony Bent, Kim Lyon and Howard Morris. Geoff Shepherd led the delivery of the working tools, ably assisted by new MMs Ben Darrington and Shaun Taylor, who did a sterling job. Tony Bent, and all assembled, were treated to a delightful ceremony of installation, and the Assistant Provincial Grand Master was greatly impressed, lavishing praise on the installing master, Howard and all the officers who took part. Once the officers were installed, Tony brought the greetings and congratulations of the Provincial Grand Master Tony Harrison and congratulated Kim on taking the chair in such a fine ceremony. He was delighted to receive charitable donations totalling a magnificent £2,778, consisting of: £450 to MCF 2021 Festival, £128 to West Lancashire Freemasons’ Charity, £350 to Ashton Masonic Hall Building Fund, £350 to Ashton Masonic Hall Development Fund, £500 to Wigan and Leigh Hospice, £100 to UK Sepsis Trust, £200 to Help for Heroes, £100 to Ella Together (a group of performing arts for people with learning difficulties), £100 to Chorley Hedgehog Rescue, £250 MTSFC West Lancashire (Masonic fishing charity) and £250 to Bryn Specials Badminton Club (a badminton club for young people with special needs/learning difficulties). Tony was extremely impressed by this wonderful charitable effort, not only by the amount, but also the breadth of worthy causes touched by the lodge’s generosity. Kim has been a member of the lodge for a long time and has been the leading light in the social life that Ashton Trinity Lodge is so proud of. He has organised the socials and fundraising events for many years, and everyone is delighted that Kim has now gone through all the offices and reached this important goal. Kim is also secretary of the Wigan Group Golfing Society, the events for which he has expertly organised for many years. With his experience and enthusiasm, there is no doubt Kim will ‘put’ it to good use, ‘drive’ the lodge forward. Pictured from left to right, are: Trevor Jones, David Kenworthy, Garry Bryon, Geoffrey Porter, Tony Bent, Kim Lyon, Graeme Hughes, David Ogden, Fred Dickinson and David Rigby.